Come live in The Steel City! Pittsburgh is transforming its look. 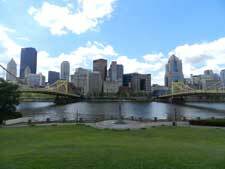 Named the ‘Most Livable City’, Pittsburgh is home to five major universities, state-of-the-art medical centers and some of the best restaurants the region has to offer. Pittsburgh is a city in the Commonwealth of Pennsylvania in the United States, and is the county seat of Allegheny County. The metropolitan population of 2,353,045 is the largest in both the Ohio Valley and Appalachia, the second-largest in Pennsylvania (behind Philadelphia), and the 26th-largest in the U.S. Known as the "City of Bridges", Pittsburgh’s 446 bridges show the historic dynamic between its steel and its people. The city skyline opposite Mount Washington offers a breathtaking view of Downtown. Downtown, Pittsburgh features 30 skyscrapers, two inclines, a pre-revolutionary fort and the Point State Park at the confluence of the three rivers. Five museums and The Cultural District tell the stories of Pittsburghers past and present who shape the city’s identity. Aside from steel, Pittsburgh has led in manufacturing of aluminum, glass, shipbuilding, petroleum, foods, sports, transportation, computing, autos, and electronics. Today, innovative tech companies like Google, Mitsubishi Electric, Uber, Bayer Pharmaceutical, and PPG Industries all call Pittsburgh home. With over 1,100 acres of combined green space, Pittsburgh’s four major greenspaces, Frick, Mellon, Schenley, and Point State Parks are beautiful places to enjoy the outdoors. Bike trails, fountains, streams and a mix of recreational fields bring people out together from all over the city. With over 90 neighborhoods within the city proper, Pittsburgh is home to various cultures, backgrounds and lifestyles. 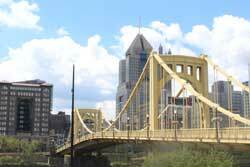 Find your place in the ‘Most Livable City’ and make Pittsburgh your home today!